This luxurious decorating resource trains the eye to recognize enduring, quality home goods and to use them to dazzling design effect. Quality matters. Just as a home s foundation should be built to stand the test of time, so, too, should the furniture, objects, and elements of our rooms speak to an enduring sense of beauty and comfort. They should outlast trends and our loving day-to-day use. But how does one recognize quality and judge whether something is well made? Christiane Lemieux set out to answer this question by interviewing the world s greatest experts. 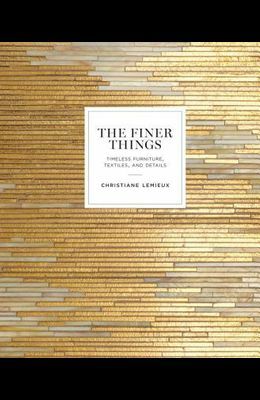 Weaving together the insights and guidance of dozens of wallpaper and paint specialists, textile fabricators, accessories artisans, and interior designers, Lemieux has curated an unparalleled education in recognizing the hallmarks of timeless, heirloom-quality pieces. Hundreds of elegant home interiors both iconic examples from the past and stunning residences today--represent the range of luxurious and customized environments that can be created with fine decor.